YOUring is a tool for enhancing the efficacy and collaboration between the user and the robot, ensures safety and free of movement. The robot with the YOUring can show the direction of the movement, by tracing the positions with the led. 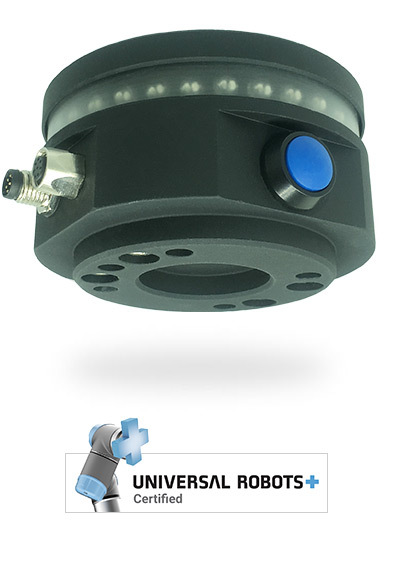 The user can benefit of a new freedrive button, directly on the tool flange of the robot and setup specific colors in order to trace specific behaviors, during the execution of a program, or also to signal a particular safety mode of the robot. New Polyscope commands are available to the user: YOUring instruction to setup lights and buzzer and Wait YOUring button instruction to wait when the user presses one or more of the YOUring buttons. Easy to use in Polyscope thanks to our URCaps Plugin! With the new YOUteach feature you can save the points in freedrive mode without the teach pendant! With this feature, developed by Alumotion and implemented in the last YOUring software release, you can record the points of the robot on the fly, for a quicker teaching activity.